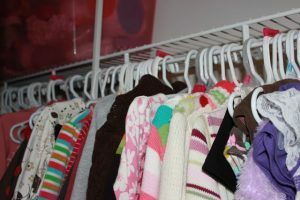 This week I’ve been sharing with you how I have changed over (for Fall and WInter) and organized my kids’ closets and drawers. See those posts hereand here. Today I wanted to show you a couple of very simple closet dividers you can make with things you have around your home. The first idea came from Family Fun. Start by cutting the top off of a milk or other plastic jug (cardboard would also work). Use a flat side of the plastic to trace the template they included. Cut it out, and wa-la! I traced it onto some very inexpensive felt (from the Dollar Tree). I made sure to trace and cut one for each side. Then I simply wrote on them with a pen and glued them on with a hot glue gun. Like it? I used them in our guest closet where I keep clothes for the following season. This helps to distinguish which clothes go to which child. Now onto an even simpler project that I came up with as I was rearranging closets and getting rid of odd hangers. Ever seen these? Sure ya have! As I was looking at them I started to think the little tab on top would make for a subtle but effective divider/label. So I traced the tab onto the same inexpensive felt from the Dollar Tree. Then I created several more using a ruler and scissors. Once I cut them to be the right size, I took a Sharpie marker and wrote right on the felt. See where I’m goin’ here? Then I just applied some hot glue…. and sort of wrapped the tab with my felt pieces. And there you go. A super easy closet divider. I was thinking I could have also made some with days of the week to help with picking out clothes for school. Here they are back in my daughter’s closet. Very subtle but it helps me to figure out what starts where. It also makes it easier when putting away laundry. Okay, finally satisfied with my kids’ closets and drawers (for now anyway). Time to take inventory and see if there is anything we are short of for fall/winter. Tomorrow I will share with you a printable shopping list I came up with to do just that! Clean Plate Club-Helping Kids Become Better Eaters.